What is teasel root? What is it used for? 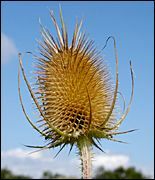 Also known as dipsacus, teasel is a flowering plant similar in appearance to a lilac, with long, cylindrical flowers and bracts (leaflike protuberances) that are curved and thorny. The plant, which grows throughout Europe and parts of Asia, can reach a height of five feet, and bears small fruits that resemble nuts. Teasel roots are used medicinally. The roots are dug up in the summer (usually July and August) and cleaned, with the fibrous material and dirt removed. The roots are then cut into slices and dried in the sun before being used in herbal preparations. In traditional Chinese medicine, teasel root is affiliated with the Liver and Kidney meridians, and has bitter, pungent and warm properties. Its functions are to tonify the liver and kidneys, promote blood circulation, and strengthen the bones and tendons. Teasel root can be used internally or externally. Internally, teasel root treats pain and weakness in the knees and lower back, helps repair damaged tissues such as bones and ligaments, and can control bleeding during a woman's pregnancy. As a tonic, it is used to control a "restless fetus" in pregnant women, often in combination with eucommia bark, astragalus, Chinese angelica and other herbs. Externally, it can be combined into a poultice with drynaria and dragon's blood to reduce swelling and relieve pain. How much teasel root should I take? The amount of teasel root being used depends on the condition(s) being treated. Generally, most practitioners recommend between 6 and 21 grams of teasel root per day. Some herbalists recommend a slightly higher minimum dose (10 grams per day). What forms of teasel root are available? Raw and cooked teasel root is available at some Asian markets and most herbal shops. Teasel root is also available in powder, capsule and pill form. What can happen if I take too much teasel root? Are there any interactions I should be aware of? What precautions should I take? When treating uterine bleeding, make sure to use teasel root that has been fried. For external uses, make sure to use a powdered version of teasel root. As a tonic, both raw and cooked versions may be used. As of this writing, there are no known drug interactions with teasel root, or side-effects associated with large amounts of teasel root. As always, however, make sure to consult with a licensed health care provider before taking teasel root or any other herbal remedy or dietary supplement. Duke JA, Ayensu ES. Medicinal Plants of China. Reference Publications, Inc., 1985. Gruenwald J, Brendler T, Jaenicke C (eds.) PDR for Herbal Medicines. Montvale, NJ: Medical Economics Company, 2000, pp. 757-758. Suh HW, Song DK, Son KH, et al. An iridoid glucoside from dipsacus asperoides. Phytochemistry May 1996;27:239-40. Suh HW, Song DK, Son KH, et al. Studies on the chemical constituents of dipsacus asper Wall. Yao Hsueh Hsueh Pao October 1996;27:1167-72. Zhang Y, Kiyohara H, Matsumoto T, et al. Fractionation and chemical properties of immunomodulating polysaccharides from roots of dipsacus asperoides. Planta Med October 1997;27:393-99.